Beach Cottage that has been lovingly restored Into the best beach vacation retreat in Mission Beach with AC, dedicated parking, built in grill, and outdoor TV lounging area with fire pit. Walking distance to favorite local restaurants - Mission Cafe, Swell Cafe, Single Fin, Saska's, Olive's & Miss B's. Steps to the Bay Beach and 1 Block to the Pacific Ocean. Experience all the luxuries of home with 55 inch HD 4K Flat screen & air conditioning. Brand new remodeled kitchen with concrete counters & new stainless appliances, seating for 6 and table service for 8. Cozy up to the Gas Fireplace on cool beach nights and enjoy movies on the 55 inch TV or listen to your tunes on the Wireless IPod player. The fully enclosed Private Patio has an outdoor TV, fire pit and comfy sectional to relax after a day at the beach. Enjoy a quiet morning coffee from the Mission or Swell Cafe that are steps away. Dedicated parking spot SUV sized , 3 Cruisers , 3 Boogie Boards, 1 single kayak, 4 Beach Chairs & Umbrella. All You Need is to Pack Your Beach Gear and Flip Flops!!!!! Married Physical therapists from Canada and Scotland that love the Mission Beach area. We've lived in the area for over 20 years, and wouldn't live any where else in the world! We wanted to be right at the beach so purchased this cottage due to the fantastic location - close to both the beach, bay and Great local restaurants. Enjoy riding, running, & walking for miles on the board walk with our furry family. Loved the quaint old cottages in Mission Beach and realized that we wanted to be on the sunny side of the street. Custom slate stone shower with rain head shower faucet and sky light with lots of natural light. Front Patio has seating for 4 with table and umbrella and built in gas grill. Back patio lounge has sectional seating for 6 with outdoor smart TV and fire pit surrounded by lush succulents. Great little house right off the bay and beach! Great location and has everything you need! Awesome home for a beach weekend! Beautiful! The pictures don’t do it justice. Best location on mission! We really loved everything about this rental. First of all, it’s just beautiful, modern, yet cozy, and you can really feel the owners attention, care and love in their home! They thought of everything to make our stay perfect! I mean an abundance of better than average dishes, cutlery, pots and pans, seasonings, condiments, cleaning supplies, towels galore, extra bedding, trash bags, laundry soap....I mean the list goes on... One of the best rentals I’ve ever been in. The attention to cleanliness, maintenance and detail are way above par for a rental. The location!!! Ya’ll doesn’t get any better!!!! Literally steps to the ocean and the bay! Such a quiet, safe area! 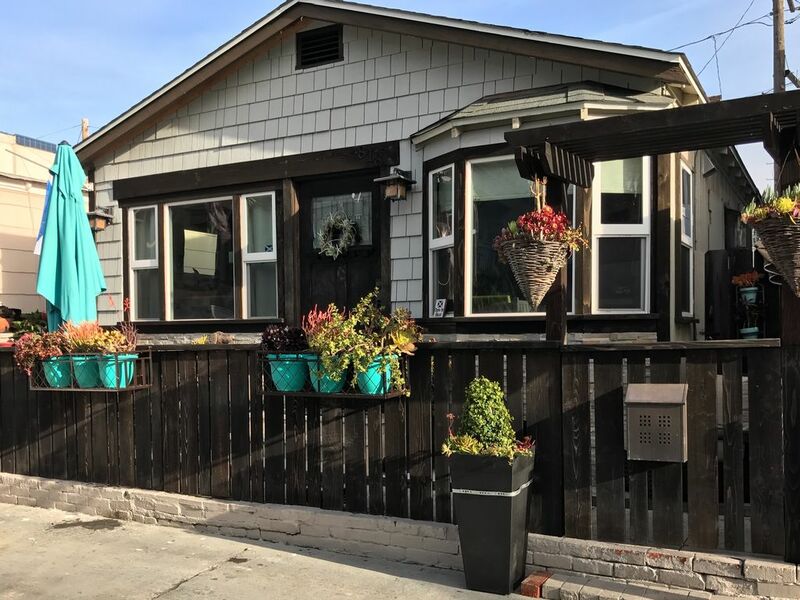 We could explore all Mission beach has to offer and still be just a short walk back to the bungalow to rejuvenate and head back out again ( or stay in, it’s hard to leave this property because it’s so beautiful) ! Great restaurants, surf shops, and sunsets! The last night we were there we ordered pizza from Rosario’s and picked it up!!! Took about 5 minutes walking to and from!!!! I forgot the mention the georgeus back patio! Absolutely our favorite relaxation place. So special. And the air conditioning!!!! Makes for a great night sleep on the super comfy beds! I could go on and on... ( and I think I have) but you won’t be disapponted and anyway renting this place! Thank you to the owners for opening their labor of love to us! although a "bit" small for a family of 4 (we knew that though going in, and its fine) the place is awesome. it's up to date, well kept and all the amenities are available. the location could not be better. steps to the bay and a short walk to the beach. we walked everywhere, and if that was too long, we used the bikes that were available. I would definitely rent this again!! We absolutely loved our stay here. Steps to both the bay and beach as well as several great restaurants! Our two boys loved making s’mores at the fire pit at night. A/C was a great added bonus, too. Would definitely stay again and would recommend it to anyone. We can’t say enough good things about this house! I stayed here with my husband and two young children and my sister and her daughter! This house is amazing! The private patio is AMAZING! It’s extremely roomy and every minor detail is incredible! We didn’t hear any outside noise and an added plus they have washing machine and ac units! Cheryl is extremely attentive to any questions and even took the time out to help trouble shot the bbq grill! We have found our rental beach house for years to come!! It’s also walking distance to better buzz coffee and many other restaurants! Highly recommend - super cute and comfy cottage in a great location! The cottage has great updates like a remodeled kitchen and bathroom. The gas stove and the convection oven/microwave are fabulous! They really went above and beyond with the remodel; no detail was missed. It truly was a home away from home and was so much better than staying at a hotel. The furniture and beds were comfortable. We enjoyed grilling on the front patio, hanging out and talking with the GREAT neighbor. The back patio with TV and fire pit was private and very relaxing. Loved the outdoor lighting on both patios and the lights automatically came on/shut off. Even the décor on the patios is delightful with solar candles, plants etc. So many little touches that just added to the overall experience. The location was perfect. Just steps to the bay on one side and down the block a little to the ocean on the other side. There are a lot of options for restaurants, bars and shops. All within walking distance. We highly recommend guacamole at Guava Beach, Pizza at Luis’s at the Beach (the 30” if you can manage was fun!) and tacos at LaPlaya Taco Shop (by the Catamaran). Ralph’s (grocery store) was a short bike ride. Take your own bags (or plastic bags are $.10/bag). We rode bikes with our backpacks. If you have a Fry’s or Kroger card, it works at Ralph’s for the extra savings. We are going to miss this cottage, warm bay water, beach cruisers and being within walking distance of so much! We would definitely stay here again! PS: Cheryl/Steven, I just realized we forgot to empty the freezer of the ice cream. Sorry about that! Thanks Wendy. We are glad you enjoyed your stay in our Mission Beach cottage & hope you can return again!